Yes, I bit the bullet and started a newsletter. Why? I don’t know. Maybe it was that New Year’s resolution to improve my marketing and promotion skills. What was I thinking? I guess I was thinking I needed a newsletter. To tell people about my books. And…stuff. So I designed a newsletter. Put my latest book buying information on it and hit send. Oops. I had no one to send it to. So please subscribe to my mailing list or all my efforts will have been for naught. I think that’s the first time I’ve ever used the word naught. That’s reason enough to sign up for my newsletter, isn’t it? How, you say? Well, just click on this link right here >> SIGN ME UP << fill in the form with your email and name, then hit the button that says Subscribe to List. How easy is that? Thanks in advance! This is my favorite time of year. The department store aisles are overflowing with bright, shiny new school supplies! I can’t resist all the colorful notebooks, pens and highlighters. This obsession with paper and notebooks began when I was very young. My mother worked for Eastern Tablet in New York and she’d come home with pads of lined paper hot off the printing presses. I’d bury my nose between the pages and breathe in the scent of fresh ink. I don’t even want to think of how many brain cells may have died in the process. My obsession continues to this day. 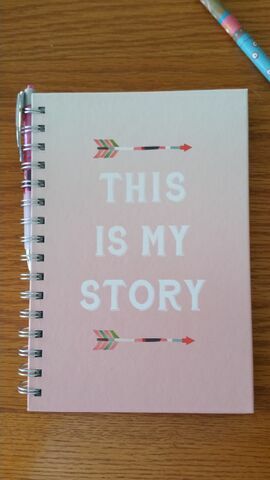 When my husband sees me contemplating a pretty new notebook, he usually says “Do you really need another notebook?” To which I reply, “Pish-Posh. 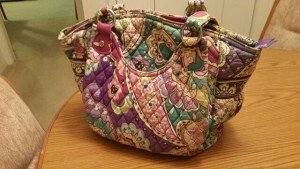 It has nothing to do with need.” Okay, I really don’t say Pish-Posh, but I think it in my head. So I’m in the store the other day and this notebook caught my eye. A shiver of delight ran through me. The manuscript I’m working on right now is titled Not Her Story. 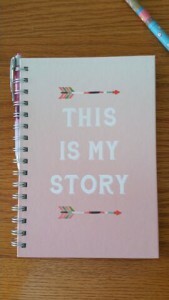 The cover of the notebook says This is My Story. Yes! Serendipity. Or is it Synchronicity? I always get the two mixed up. Do I need a new notebook? Nope. Do I want it? Yes, oh yes! Did I buy it? You betcha! And that’s my story. Romance Writers of America held their annual conference at the New York Marriot Marquis in Times Square and it was an event to remember! I rubbed elbows with some of my favorite authors – Nora Roberts, Carla Neggers, Sharon Sala, Kristen Higgins – and attended workshops with over 2,000 published and aspiring writers. I was also lucky enough to spend some quality time with my wonderful agent, Linda Scalissi of 3 Seas Literary Agency, and my roommate, the funny and talented Christine Wenger. The workshops were excellent and now that I’m home, it’s time to put all that knowledge to use! So glad you dropped by my new website. Isn’t it pretty? Makes me want to curl up with a hot cup of coffee and a good book. I have my dear friend Josephine Piraneo of Glass Slipper Web Design to thank for designing it. Jo is fast, efficient and talented. I highly recommend her if you’re planning to update your website or build a brand-new one.